This is a guest post from horn player and one of APO’s wind coordinators, Tom Brett. The day in question was Sunday 20th January, during the rehearsals for our Music of Desire concert (on Saturday 2nd February). The third day of rehearsals is when things really start to happen. 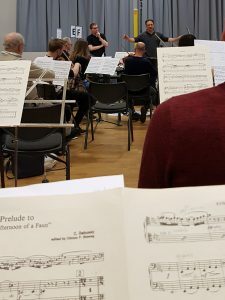 We’ve all been away for 2 weeks – having (delete as applicable) been shocked into action by how rough the first rehearsal weekend sounded / got some idea of which are the difficult bits we need individually to fix / absorbed the rehearsal notes provided online in the meantime by Andrew, our conductor. We come back on the morning of rehearsal day 3 and suddenly find that we sound like something resembling a symphony orchestra! In my case, the thing which had most shocked me into action was being unable to hold on in one breath to the long first chord in the Saint-Saëns “Bacchanale”, accompanying a cadenza on the oboe. Oboists are notorious for being able to keep going for insanely long phrases in one breath, but at the first rehearsal I had needed two or even three! I’m not sure what the neighbours made of the interminable long note practice emanating from my flat – but after two weeks, I’d got it up to 40 seconds – which I was reluctant to admit on social media, in case Michael, our principal oboe, took it as a challenge to outlast me! As it was, he clocked in at 23 seconds, and all 4 of us horns held on just fine. Caroline and I job-share the co-ordinating role for APO’s wind and brass players, and in fact our day had started with a logistical headache before even arriving at the venue, when one of our bassoonists messaged in sick. After a predictably fruitless attempt to find a substitute at no notice on a Sunday morning, one of our violists who also plays bassoon agreed to switch over for the most critical pieces. We have some versatile people in APO! – not least one of our violinists, Laura Shipsey, who has composed a new piece, “Samara”, commissioned by the orchestra especially for the forthcoming concert. Laura’s piece was second up this morning, after working on the Saint-Saëns. One of the exciting things about APO – the “APO differences”, compared to other amateur orchestras – is commissioning and performing a brand new work once a year. It’s something I personally find both challenging and rewarding. Most years, the rehearsal cycle follows a similar pattern. At first we fight our way through a totally unfamiliar score, it makes no sense whatever, and we come away thinking “well this is a bit rubbish”. By the third rehearsal – today – it’s starting to fit together and sound like music. Laura’s 6-minute “Progcast” ( https://www.aldworthphilharmonic.org.uk/blog/progcast-laura-shipseys-samara/ ) really helped with this. Next weekend we’ll apply the polish, and by the concert day we will be absolutely loving it – and so will our audience! Having heard Laura’s commentary, I found myself imagining a cinematic track to the music: following the life cycle of a sycamore seed from ripening on the tree, being whirled away in the wind, to crash-landing, oblivion amd regrowth. If I were skilled enough, I would actually go away and make that film! We rounded off the morning session by rehearsing for the first time with our soprano soloist in Ravel’s Shéhérazade. Karen Speight is a British Airways Captain in her day job – see, I said APO people are versatile! Accompanying a vocal soloist requires great precision and musical awareness, especially in such a hauntingly and delicately beautiful song cycle as this. Of course it’s possible to go through the notes without the soloist, but having her with us really brought the music to life, especially for those of us like me who hadn’t known it before. We ended the day with another new experience: a masterclass given by conducting guru Lev Parikian. 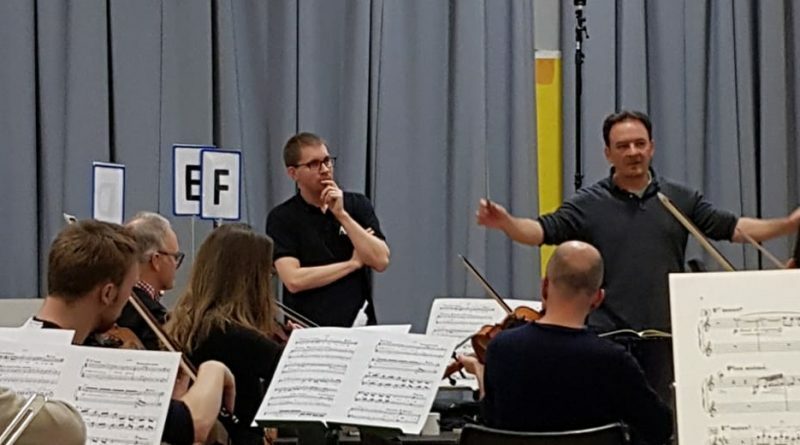 As amateur players we are used to being on the receiving end of instructions and feedback during rehearsals, so it was instructive as well as novel to hear instead what Lev had to say to Andrew. My favourite was the concept of “less is more” as regards beats in the bar: having plastered my music with pencil markings “IN 12” – “IN 8” – “IN 4”, I had actually been finding these more confusing than helpful, plus it commits the conductor to having to remember – and execute – exactly what he said he’d do where, rather than being able to go with the flow of the music during performance. “The view from the back” is that if one understands the music, it should be obvious whatever the conductor chooses to beat, as long as the beat is clear! After the final chord of Debussy’s “Prélude à l’Après-Midi d’un Faune” had faded away into silence, the day was far from done as the hall had to be returned to school exam configuration, timpani returned to their storage, and in Caroline’s and my case an evening flight to catch back to Berlin and the day job. Next weekend’s rehearsals can’t come soon enough!